A really Easternchallenge that I enjoyed very much but in fact I prefer more the artisanal chocolate eggs. Anyway this was a pleasant and uncomplicated drawing with Zenith, Wavlin and Safflower, made with a black pen and finished with a bit of Springcolours! I wish everybody a happy Eastern and a good start of a beautiful Spring! Diva Dance is ook één van mijn favorieten en zeker sinds Helen Williams ons verschillende manieren toonde om deze tangle zo speels te tekenen. Op de onderstaande tile zie je dus Diva Dance in de hoofdrol maar een mooie bijrol is weggelegd voor Susie NG’s nieuwe tangle Spluk. Een paar lege vlekjes werden opgevuld met Dewdrops en Perfs en aan de buitenzijde van twee hoekjes zie je nog een paar Beadlines. Dit was opnieuw een erg leuke challenge die ik getekend heb met een zwarte pen op een grijze tile . De afgewerking werd gedaan met een oranje kleurpotlood en een witte gelpen. Diva Dance is also one of my favorites, especially since Helen Williams showed us a different way of drawing this wonderful tangle. On this tile you can see Diva Dance in the leading role next to Susie NG’s cheerful tangle Spluk. E few empty spaces are filled with Dewdrops and Perfs and on the outside of two corners you will notice a few Beadlines. I enjoyed this challenge very much and have drawn with a black pen on a grey tile. The finishing touch is made with an orange colourpencil and a white gellypen. Deze tile werd gemaakt met originele tangles van Rick, Maria en Molly’s echtgenoot: Fescu, Bales, Crescent Moon en (Wholly) Hollibaugh. Ik heb gekozen voor een grijze tile en naast een zwart potlood en een zwarte pen heb ik ook een blauw kleurpotlood en een blauwe pen gebruikt. De” finishing touch” gebeurt zoals altijd met een wit krijtpotlood en een witte gelpen. Een leuke challenge waar ik veel plezier aan beleefd heb. This tile is made with older original tangles from Rick, Maria and Molly’s husband: Fescu, Bales, Crescent Moon and (Wholly) Hollibaugh. I have chosen to draw on a grey tile with a black and blue pen. The colouring is done with bleu colourpencils. For the “finishing touch”, I can’t miss my white charcoal and white gellypen. This was a fun challenge that I enjoyed very much. Rond kerstmis heb ik een e-boekje gekocht bij Eni Oken: treasure frames. Daaruit leerde ik om mooie kaders te maken, bestaande uit verschillende patronen. Deze kader gebruikte ik al om mijn Nieuwjaarswensen over te brengen op mijn blogpost. De wensen werden verwijderd en vervangen door Msst, Z-lines en Lisa’s nieuwe patroontje: Elojoe. Hij past nu ideaal bij Joey’s challenge. Ik tekende de originele kader op een eco-dyed achtergrond maar gebruikte voor deze tile een kopie waardoor de achtergrondkleuren een beetje verbleekten. De getekende tangles zijn: Coil, Remo, Barberpole, N’Zeppel, Shattuck, U-too, Printemps, Crescent moon, Jetties, Toodles-Flower, Slowpoke en Pokeleaf. Er werd getekend met zwarte, bruine en witte pennen en gekleurd met gewone kleurpotloden. A few days before Christmas, I bought Eni Oken’s treasure frames. This is a lovely e-book in which she teaches us to draw wonderful frames, made of several tangles. So this is one of my results, finished soon after her lesson. I used this tile already to wish everybody a happy new year on my blogpost. I removed the wishes and draw inside the frame Msst, Z-lines and Lisa’s new pattern Elojoe. Now, the tile is suitable for this challenge. The original frame was drawn on an eco-dyed background. I have made a copy and unfortunately the backgroundcolours became a bit paler. A lot of tangles are used: Coil, Remo, Barberpole, N’Zeppel, Crescent Moon, Jetties, Shattuck, U-too, Printemps, Toodles-Flower, Slowpoke and Pokeleaf. I have drawn with black, braun and white pens and coloured with ordinary colourpencils. Voor de achtergrond op deze tile heb ik eerst met een kaars een paar lijnen getrokken (daar pakt geen verf op) Daarna werd er wat aquarelverf en Bisterpoeder op gesmeten en als de tegel droog was, begon het “echte” werk. Naast Verve, die ik echt een supertangle vind, zie je nog andere lievelingetjes: Mooka, Molygon, TIpple, Caviar, Fescu, Msst,Shattuck en een paar krulletjes… Deze tile heb ik opgediept uit de oude doos maar paste volgens mij ideaal bij deze challenge. Ik tekende met witte en zwarte pennen en helemaal op het laatst heb ik hier en daar de kleuren wat versterkt met blauwe en bruine kleurpotloden. Af en toe eens in je oude tiles duiken, levert soms leuke verrassingen op! To create this background, I have drawn a few lines with a candle. (they stay white, while colouring). Then I have used some watercolours and Bistrepowder on the tile. When the paper was dry, the “real” work begun. Beside Verve , a real supertangle, you also see a few other little darlings of me: Mooka, Molygon, Tipple, Caviar, Fescu, Msst, Shattuck and a few curls… I have found this tile in a box with older tiles but it was a good one to send in for this challenge. I have drawn with a white and black pen en made the colours a bit stronger with blue and braun colourpencils. To look to your older tiles, can sometimes give pleasant surprises! Voor deze tile heb ik mijn waterverf en Bisterpoeder nog eens bovengehaald. Daarna volgde de eerste tangle Crest Ver 2, getekend met een bruine pen. Als ik met waterverf “speel” laat ik meestal gewoon de kleuren wat door elkaar lopen. Je krijgt dan mooie “kringetjes” . Een grote scheidingslijn werd benadrukt met een witte en een zwarte pen. Dan volgde Tupi ( sinds vrijdag te vinden op Tanglepatterns.com,) en daarna tekende ik Verve en Mosi. Met enkele krulletjes en Perfs vulde ik wat lege plekjes op. Uiteindelijk werd de tile bijgekleurd met gele oranje, groene en bruine kleurpotloden. This tile is drawn on a background of watercolours and yellow Bistrepowder. When I “play” with watercolours, I like to let just flow the colours into each other, you become always surprising effects. I started with a black and white pen, just following “a line” created by the watercolours. The first tangle I put on the tile was Crest Ver 2. Then I chose for Tupi ( last friday published on Tanglepatterns.com) Verve and Mosi followed, all drawn with a braun pen. A little curl and Perfs are always nice to fill little empty spaces and finally I made the colours a bit stronger with yellow, orange, green and brown colourpencils. Voor deze challenge koos Laura voor Siri (Si van Simone and ri van Ria). Het maakt me blij dit mooie patroontje in de hoofdrol te zien. Ik heb Siri als kader getekend hoewel het ook heel mooi kan zijn als achtergrond. In mijn kompositie heb ik volgende tangles gebruikt: Siri, Crescent Moon, Tink en het fragment K14. De “achterliggende” vakjes werden gekleurd met zwarte, paarse , rode en turkooise pennen en een grijs potlood. Opvullen met Perfs zie je regelmatig in mijn werk opduiken en ook hier gebruikte ik deze techniek. For this challenge, Laura chose Siri (Si = Simone and ri = Ria). I’m glad to see this lovely pattern in the leading role. I chose to draw Siri as a frame but it looks nice as a filler too. In my composition I have used Siri, Crescent Moon, Tink and the fragment K14. I filled some “squares in the background ” with black, purple, red and turkoois pens and a grey pencil. Regulary I like to use Perfs to fill empty spaces and that is what I did here also. On March the17 th, the start of the twelfth mosaic of Annette Plaga will be published on her site. It’s nice to see your own tile, integrated in the great work, composed with participants from all over the world. After the publication, Annette sends all employees a small personal copy.. I appreciate this very much and I am glad to contribute to such a beautiful project. Used tangles:Tipple, Bubbles, 5C Aura, Hollibaugh, Lenche, Toodles, Batumber, fragment K14 en D14, Footlikes, Ovolution, NKD. February was cold and dry but even at this (for us Belgians) low temperatures the sun did her best and that was wonderful after all the rain of the last months. And soon real spring will be there. This little black panther has come into our lives unexpectedly. She was wild and starving, and we didn’t have the heart to chase her away. We made a sheltered place for her and give her food regularly. We lured her into a cage and brought her to the vet for vaccinations and a sterilization and now she has become “ours”. Every day she comes friendly to say hello but at the moment, she doesn’t want to be touched, yes she’s really a bit wild but that will change, I’m sure.. Miles and Jools are jealous and they don’t like her but Rob and I do! Used tangles in the second drawing: Diva Dance, Hibred, Cubine, Widgets, Stircles, Meer, River, Festune, N’Zeppel and Mosi. Easter is a real family celebration and in Belgium also second Easter is a paid holiday. When the sun will shine, it will be crowded on our coast or Ardennes. We prefer to avoid the hustle and bustle and just stay at home, enjoy a nice Easter brunch together with our children.. and of course I will try to fool my husband. It is only once a year 1 April and then it’s aloud!!! I never kick in, but my husband is always a victim and I like that. (LOL). 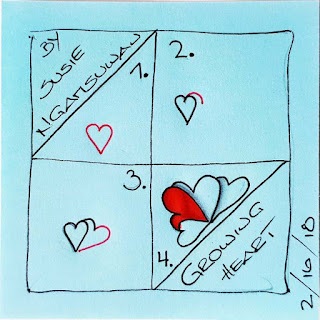 Susie NG is, just like me, not fond of hearts and yet we have both made a new pattern with hearts. That is why I made a tile with her Growing Hearts and my Hidden Hearts. And now I promise, the tangles with hearts will be put away for another year. I have the following tangles drawn on a tan tile: Clob, Kogin, Growing Hearts, fragment Z6, Hidden Hearts, Tipple, Beadlines and Mooka. The small squares in the frame are just a fantasy. For this presentation I took a card of Maria Thomas. Also on Joey’s site I got a nice surprise to see Lisa’s wonderful Zentanglework. She made a beautiful Zendala in which she combined Nouvart with other lovely tangles. I like it very much!!! Something completely different was shown in the “kitchen table tangles”. Inspiration for the following tiles was found in the video below. I have made a composition of Hollibaugh, Mooka, Tipple and Jetties. Just like Rick, I have made “holes” in Hollibaugh in a way you could see the background. Rick and Maria call this technique: “Wholly Hollibaugh”! This man is longing very much for Easter and has already hung 10,000 decorated eggs in his apple tree! “The devil is in the tail”, we are experiencing that very well in Belgium. It is very cold at the moment and a lot of snow has fallen this night. To stay in that magic mood, I have chosen a special song from the high north of Europe, mounted on unique photos of that beautiful piece of nature. Een leuke string en twee mooie patronen vormden de start van deze challenge. Ik heb mijn tile afgewerkt met een zwarte pen, grijze, groene en blauwe kleurpotloden, een wit krijtpotlood en een witte gelpen. De combinatie van Inapod en Roloflex vind ik heel geslaagd. Ik bedank Adele voor deze uitdaging waar ik veel plezier aan heb beleefd. A funny string together with two beautiful patterns gave a nice start for this challenge. I have worked with a black pen, grey, green and blue colourpencils, a white charcoal and a white gellypen. I like the combination of Inapod and Roloflex very much. Thank you Adele for this challenge which I enjoyed very much.